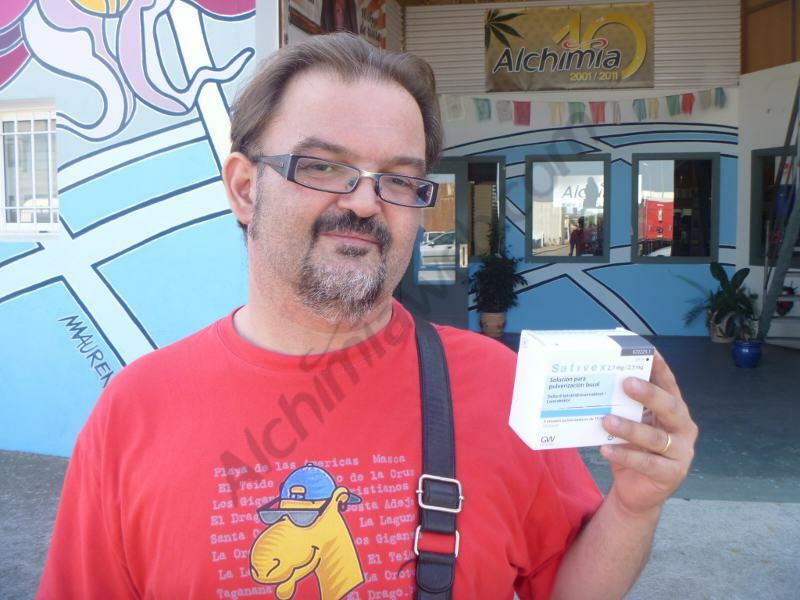 We have spoken to Màxim, a multiple sclerosis patient who has been using Sativex for more than 6 months to alleviate the pain caused by this disease. Here you have the interview; we would like to thank Màxim for his cooperation, as everyone who can benefit from his experience using this drug will surely appreciate his testimony. Màxim at Alchimia, where he told us about his experiences with Sativex. “I have suffered multiple sclerosis for some years. When I was diagnosed I was told that the disease wasn’t necessarily painful, but about 5 or 6 years ago the pain started to be very intense in my legs, and this affects my daily life. I used to have the hardest time and I still do at night and this has its consequences: I don’t get to rest, rolling around in bed, being unable to sleep… This also had an impact on my wife’s life, who wasn’t able to sleep because I couldn’t stay still in bed. During a regular check-up I told my doctor that the pain was turning more intense and I seriously asked to be referred to pain clinic, in case anything could be done, because I had reached a point where I could not take it anymore – it was unbearable. I remember that day, going back home, my wife was driving the car and I was crying for the pain I had in my legs. I was then 37 years old. They ran a test on me with botulinum toxin, better known as botox . In addition to its aesthetic function, it is also used to lessen the pain. 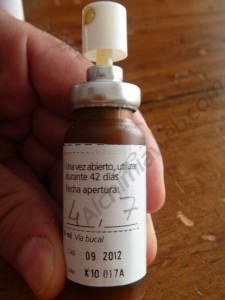 In the first session they injected a low dose, directly on the quadriceps (4 shots each). OMG! I was in so much pain!!! The first session went very well and the pain was significantly reduced. It seemed that the thing worked, but the effects of botox lasted about 1 month. At the second session of botox, the dose was slightly increased… it hurted like hell, but it was worth it. To my surprise, after a while I realised that my quads were disappearing. Now, I have a hole in each leg due to muscle loss. I mentioned it to the doctor and he quickly referred me to a specialist in musculature in Barcelona. More tests. I was monitored with small needles in my legs connected to a screen. And the final conclusion was that they assumed that the cause was botox, but they couldn’t understand it because they had never seen anything similar. This is what they told me, so I had to give up the treatment with botulinum toxin. 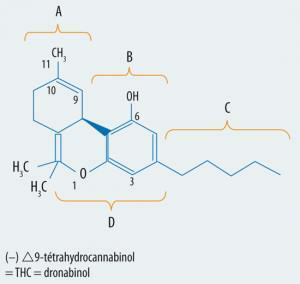 I had already read about the benefitial effects of marijuana on sclerosis patients. I smoked cannabis when I was younger, although only as recreational drug. So I got a very small amount of marijuana to see how it worked. I used it at night, right before going to sleep. I was able to sleep again, not a complete rest, but at least I could have some sleep. Anyway, the pains returned every morning. I kept my doctor informed about all this during my regular exams. 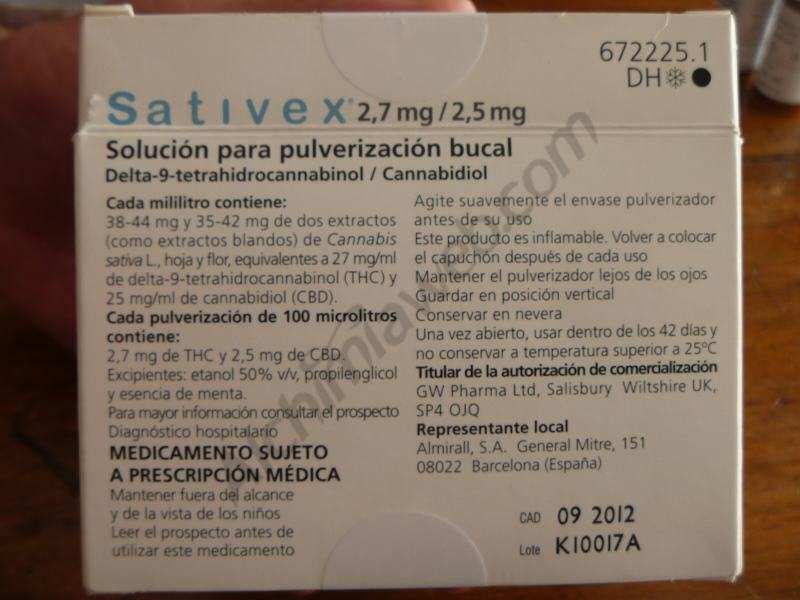 I had heard of Sativex, but it still wasn’t approved by the sanitary authorities here in Spain. I had no choice but to wait, so I decided to grow my own cannabis. I went to Alchimia Grow Shop, in Vilamalla (Girona) and I asked for all the information that I needed about how to grow, which strain to grow, etc…I got my growing tent , lighting system, soil, seeds…everything I needed, I guess you know the process. So I finally had my medicine…three years have passed since then. One day, the doctor called and told me that Sativex was finally available for me. A new hope opened…Let’s try it then! I felt a bit like a laboratory animal, but I had to try it. The pain in my legs was horrible! What benefits did you notice when using Sativex? Benefits? Well, it was too early. I quickly felt that I could sleep better, it seemed that it was working. I only had to wait some weeks and see the results. The recommended dosage is 10-12 daily sprays. Is it enough or it depends on each patient? It should be said that you can’t find two identical sclerosis in the same way that you can’t find two identical persons. Neither the symptoms nor the patients are the same, that’s why doses may vary from one patient to another. The ideal dose for this medicine to be effective is 8 sprays per day; you can increase or decrease this number, but never take more than 12 daily sprays. You have to spray it twice in your mouth and wait about 30 minutes to take effect. During these 30 minutes you can’t eat or drink anything. It is a bit hard because of its unpleasant aftertaste, so after waiting those 30 minutes I always eat some candy. 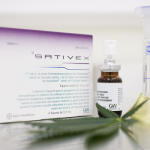 When I started the treatment I was told that Sativex is a concentrate and, therefore, the effects could be stronger than smoked marijuana. It all was about finding the correct dose for me, and the best way to do it was experimenting until finding my ideal dosage. At the beginning, I used to feel dizzy until I finally found that dose, which in my case is around 8 sprays per day: 4 after having breakfast and 4 before going to sleep. During summer, with higher temperatures, I feel dizzy more often so I just take the second dose (2 sprays) after lunch and the remaining 4 sprays after dinner. Have you noticed differences between the effects of Sativex and vaporized marijuana? First, I should say that I didn’t vaporize marijuana, but smoked it. I only vaped when I was travelling. Still, there are always limitations. Sclerosis is still there and I have and feel the handicaps that Sativex can’t cure. It only lessens the pain. The good thing is that now I have no excuses to quit smoking, which is no small thing! Is the pain from spasticity quickly relieved? Today, I’ve been using Sativex for more than six months. Obviously, miracles doesn’t exist. I still feel pains in my legs, but neither as often nor as intense as before. I guess it is caused by the continous use of this medicine. If the pain in my legs increases, what I do is taking an extra dose, so I know I’ll feel better in a while. Do you think Sativex should be used in other treatments (chemotherapy, neuropatic pains, anorexia-cachexia)? Radically YES. And not only Sativex. From the point of view of someone who suffers the effects of a disease, I absolutely agree with any kind of investigation and research. 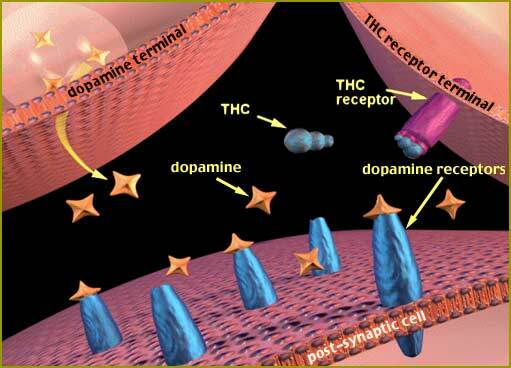 “Drugs” have many therapeutical properties, that is well-known. We are in the XXI century, and genetic engineering is advancing very fast. But we are still chained to a history that makes societies intolerant towards any novelty in this field. I don’t wish that to anybody, but sometimes I’d like to see the point of view of these people if their kids had a health problem. We actually saw what happened when the abortion law didn’t exist in Spain; clandestine journeys to London or Switzerland, etc…but, of course, all these people could afford breaking the law. 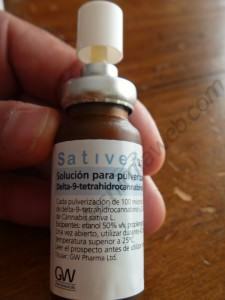 Have you noticed psychoactive effects when using Sativex? No, not at all. I do feel a bit dizzy, an unpleasant feeling. If Sativex wouldn’t work, I wouldn’t be using it at all. It is not the same than smoking marijuana , what puts you in a good mood. Have you tried asking the authorities for a license to grow your own cannabis for medicinal use. No. I have never even thought about it. I’ve been so busy with other aspects of my life that right now I consider it a waste of time. To me, it is easier taking the initiative and grow cannabis without asking the authorities for permission, and if I get in trouble, then I’ll see how I deal with it. I’m about 15 years into my primary progressive multiple sclerosis, it’s been 3 or 4 years now that I haven’t been able to walk at all. Every part of my body hurts, every minute of every day is hell. Most of the time I have a hard time even seeing food as food, things that I’ve loved to eat all of my life have become like foreign objects to me. I don’t know how I could manage without my marijuana, it helps with everything, from the physical, to the emotional/mental well being, to making food more appealing. This stuff sounds like it would be worth a try to aid in the physical aspect, though it’s probably not available in the US, I’ll have to look into it. Thanks for participating in our Blog. Living a situation in which patients have to beg for the medicine that heals them is so ridiculous. Makes me wonder where is mankind headed to? As a 60 year old Veteran rated permanent and total @100%, losing use of BOTH arms Painfully and slowly it’s not pretty seeing me cry with agonizing searing burning pain… Sleep is a crap-shoot and TO THINK that the United States Department of Health & Human Services since 2003 (15 YEARS!) has had a U.S. PATENT on POT !!! 6630507, & allows a European company (G.W. 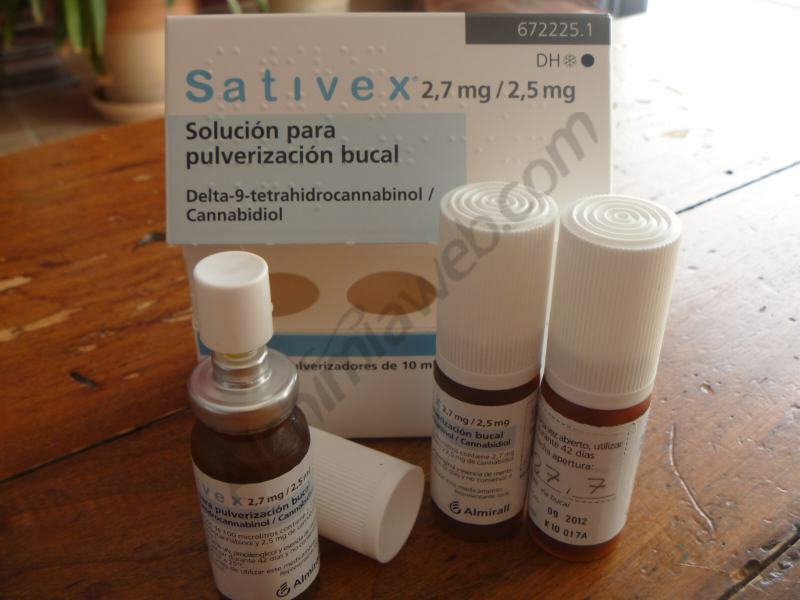 PHARMACEUTICALS) to market the DRUG SATIVEX plus more & more patents…. Now, for Neuroprotectants, they CAN CHANGE MY LIFE but… schedule 1 says pot has NO-MEDICAL-USE… Lives ruined, fellow Brothers & Sisters DAILY PUNCH OUT due to pain pain pain & more PAIN, YET, my government would CRUCIFY ME, for growing a PLANT !!!! WHY? WHY? WHY? am I even writing this ???? It is “INSANITY” & “INHUMANE” to treat THOSE THAT GAVE this way… We need 5 to 6 million Vets at D.C. asking WHY…… Breaks my heart to KNOW how MILLIONS of Lives could be SAVED if not for the GREED, LYING, USING, COLD, CALLOUSED BASTARDS THAT THEY ARE… Liquor, Shooting HEROIN or Fentenol in front of ems, cops, fireman & ALL WITH “NARCAN” READY just so the individual DOES NOT DIE & they come back over and over..in my AMERICA… The irony is enough to cause “INTENTIONAL-INFLICTION-OF-EMOTIONAL-DISTRESS” hourly, daily, monthly YEARLY and 15 YEARS…. bummed but hopeful that this very DANGEROUS FARCE can be ruled on by the UNITED STATES SUPREME COURT. … someday, somehow, someway.